I was going through some images this morning to show to a client doing an infill project and thought it would be fun to put them all together here, too. 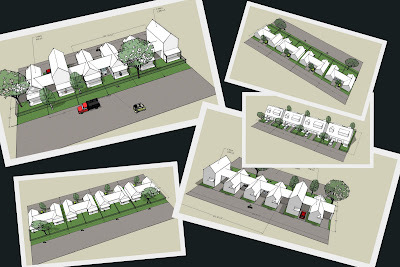 These are all sketches and studies we've done in the last couple of years for various infill projects. 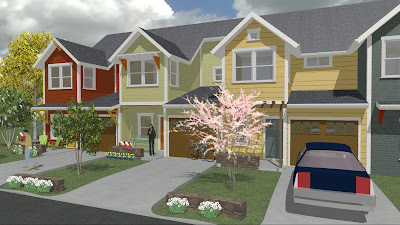 We've created townhouses, duplexes, "Urban Cottages" and hybrids of all of the above. Many of you have seen the great freestanding cottage homes we've done with Momark Development, but we've found lots of other great ways to solve the infill puzzle. They don't look like duplexes, townhouses, and "patio" homes we've all seen before, do they? Just like all of our residential work, these houses all have light on two sides of most rooms, even when they're attached housing types. They have porches and yards, and the interiors are ultra livable and efficient. Beyond the architecture, the housing types are all designed to create shared space that engages all of the residents in a neighborhood setting. Another way of saying that is that the space between the houses is often more important than the houses themselves. For us, it's all about building a Community vs. building a Commodity! We can show you how to build these puppies on infill lots as small 1/2 an acre!